Modular Ramps for Homes & Commercial Buildings | Free Shipping! If you're looking for a way to make your home or commercial building wheelchair accessible, a modular ramp is an excellent option. 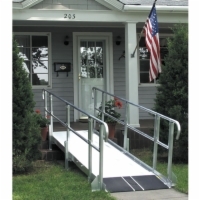 Modular ramps are extremely durable and customizable to almost any residential or commercial setting. All of our ramps are ADA-compliant and are customizable to any situation with straight ramps, 90 degree turns, 180 degree switch backs. Because of their aluminum design, these ramps are virtually maintenance free because they will never rust or corrode. Unlike wooden ramps, a modular ramp will never rot or need to be painted or retreated either. Modular ramps can easily be taken down, moved, and adapted to other settings. This makes them easy to setup and also easy to sell, if there ever comes a time when you don't need a ramp anymore. Call one of our ramp specialists today and see how you can make your home or commercial building wheelchair accessible with a very affordable modular wheelchair ramp! You may also be interested in a home wheelchair lift or commercial wheelchair lift.